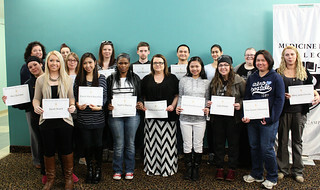 On February 9, 2016 Medicine Hat College’s (MHC) Brooks Campus held their annual awards ceremony. An event that according to Reg Radke, manager of regional stewardship is an opportunity for the college and community to applaud the accomplishments of their students. Amongst the winners were practical nursing students Katharina Banman, who received the Outstanding Student of the Year award, and Sheryl Dowler the Spirit of Learning recipient. Dowler, according to Radke is a student that has not only proven strong in her academic career but her personal life as well. This year’s ceremony took a surprising turn according to Radke who was named Employee of the Year. Other awards given out included honour role, program and scholarships. For a full list, click here.